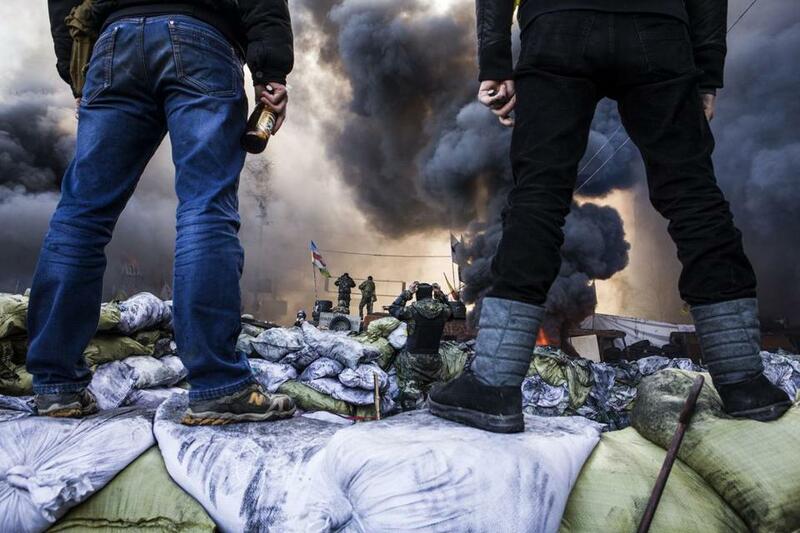 Demonstrators stood on barricades during clashes Feb. 18 with riot police in Kiev. Violent upheaval is now afflicting countries in almost every part of the world. Americans are eager to do whatever we can to help calm these crises. After a century of global power, this impulse is embedded in our national psyche. Americans are instinctively compassionate. We hate the thought that people are suffering anywhere. Our leaders know this, and whenever they plan interventions, regardless of their true goals, they insist that their only motivation is to promote peace and human rights. There should not be an automatic connection, however, between the horrors unfolding in other countries and the need for the United States to intervene. The idea that American intervention becomes more urgent when conflicts intensify is fundamentally flawed. A better standard would be to ask whether there is a real prospect that our intervention can provide better lives for people in the long run. Looking around the world right now is even more depressing than usual. Bloody confrontations are shaking Ukraine, Venezuela, Syria, the Central African Republic, and Thailand. None of these, however, is of truly global import. All are regional. Regional actors, not the United States, should take the lead in dealing with them. Consider the newest crisis in Ukraine. Some American politicians are demanding that Russia be made to “pay a price” for its violation of treaty obligations and the principle of national sovereignty. Russian actions have been thuggish and flagrantly illegal but may also be seen as a push for what geopoliticians call “strategic depth.” No country wants to have enemies close by. Shots were fired at a base and at least one person was wounded, the base commander said. 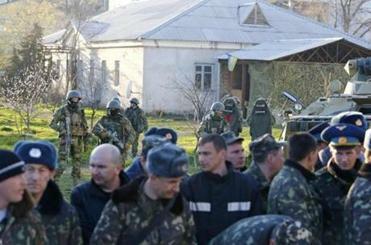 Meanwhile, residents in eastern Ukraine rallied for secession. Behind the facade of NATO, the United States has placed nuclear missiles directly on Russia’s borders. It is as if Mexico invited the Russians or Chinese to deploy such missiles in Tijuana. That would be well within Mexico’s sovereign rights — but the United States would not tolerate it. Assuring that our country is never attacked with nuclear weapons is a vital interest. Keeping Russia out of Crimea is not. The other newly frightening world crisis is in Venezuela. Its leftist government is losing control of the country. Violence is spreading. Few dare utter the phrase “civil war,” but it is not out of the question. Now, before such a conflict breaks out, is the moment for outside intervention in Venezuela. The United States, however, cannot possibly mediate because it has been working assiduously for years to destabilize the Venezuelan government. Nor can the Organization of American States, which, like NATO, is widely understood as a tool to promote US interests. Without outside mediation, conflicts in Ukraine and Venezuela are likely to intensify, possibly with tragic results. Ukraine is in the heart of Europe, so Europeans are the logical ones to mediate and, if mediation fails, to decide what the West should do next. Latin Americans — most likely from Brazil, the regional superpower — are best qualified to play this role in Venezuela. The United States should encourage these processes and pledge to abide by their results. A crisis far bloodier than these two is devastating Syria. For a time, especially after the release of photos showing victims of poison gas attacks, it seemed likely that the United States would launch bombing raids there. Fortunately, cooler heads prevailed. The carnage tearing Syria apart is truly mind-boggling, but the suggestion that American bombing could end it is no less so. Another kind of crisis grips the Central African Republic, where state authority has evaporated and given way to anarchy. Thousands have been killed in recent months. A quarter of the population is displaced. Troops from African countries, including 850 from Rwanda, who have seen the results of mass murder in their own country, are trying to calm the situation. Just as it is Europe’s job to deal with Ukraine and Latin America’s job to calm Venezuela, Africa bears responsibility for the Central African Republic. If it fails, its historic challenge is to find ways to build more effective mechanisms for intervention next time — not to call in blunderers from across the seas. Asia is not immune to the wave of global turmoil. Its most intense crisis is in Thailand, which has been an American ally from the days when it served as a US base during the Vietnam War to its more recent role as host of a secret CIA jail where kidnapped prisoners were subjected to “enhanced interrogation.” Thailand’s political upheaval has led to massive demonstrations and is spilling over into communal violence. Americans have every reason to be distressed, but little reason to believe they can improve the situation. Big powers cannot ignore trouble abroad. On the contrary, the United States should act energetically whenever it can — but in concert with other countries and through politics, economics, and diplomacy, not by bluster and threats. American policy should be aimed at de-escalating conflicts, not intensifying them by staking out one-sided positions. We like to believe that humanity is making steady progress, rising inexorably from barbarism toward freedom and global peace. This is nonsense. The American character has a utopian streak. Sometimes it leads us to forget an essential lesson of history: that conflict, violence, and injustice will always be part of the human condition. Americans have every right to be outraged at this reality, and to do whatever we can to defend human life and promote peace. Too often, however, we delude ourselves into thinking we can help other countries, only to find years later that we have produced immense tragedies. The world is littered with examples of countries that have suffered terribly from American efforts to help. Iran, Guatemala, Vietnam, and Chile are among the 20th-century victims. Afghanistan, Iraq, and Libya are the more recent ones. Let us not add to that list.